I was in the grocery store yesterday morning and as I walked by the produce section the fragrant smell of peaches hit me. Oh goodness. I love fruit and veggies year round but there is just nothing in this world like the flavor of in season produce. With that in mind, I’m bringing you my peach lemonade. Today I’m showing you how to make it with canned peaches but fresh work even better. The main benefit of canned means you can have this year round. The instructions are the same no matter which you use, you’ll just peel and pit your fresh peaches first. I’ll be making mine with fresh in July or August, when the clingfree peaches come in, because those are my favorite. This peach lemonade is sugar free except for the natural sweetness of the peaches themselves and it’s a wonderfully delicious treat that will delight everyone! Don’t want to use Crystal Light? Use your favorite lemonade mix in it’s place, no worries. Let me show you how easy this is and then we can all take a break and chat at the end of the post. 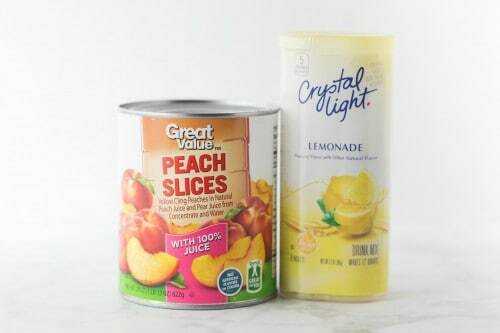 To start with you’ll need a 29 ounce can of peaches in juice and enough Crystal Light to make 2 quarts (1 packet). If you are using fresh peaches, I’d use 3-4. Peel those and remove the pits. 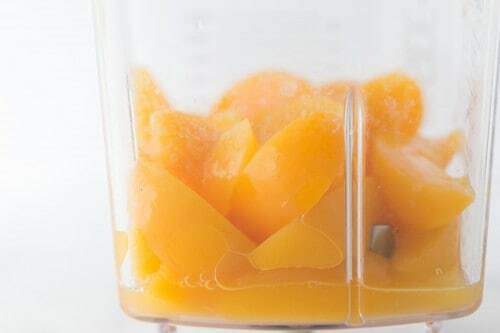 Place peaches in blender and puree until fully liquified. Don’t drink it. I know it will be tempting. Okay, taste just a little bit 🙂 If you’re using fresh, in season peaches, now is a great time to peel and eat one as a snack. I love fresh peaches but I cannot handle that fuzzy peel. Have you ever peeled and sliced a really sweet peach and then put it in a bowl and poured heavy cream over it? MMM! Fill a 2 quart pitcher up halfway with water and stir in lemonade mix until dissolved. Add peach puree and stir well. Place in fridge for a few hours to chill or serve over ice immediately. INSTANT SUMMER! Click here to see this recipe with strawberries! Now grab a glass of peach lemonade and step out onto the back porch with me for a bit. Now that summer is finally here, do you have any travel plans or are you planning on staying close to home? We have a little trip planned with family but other than that we just tend to be homebodies and enjoy being home as much as possible. I work all day each day but I take great delight in stepping out on my back porch with a glass of tea in the evenings. 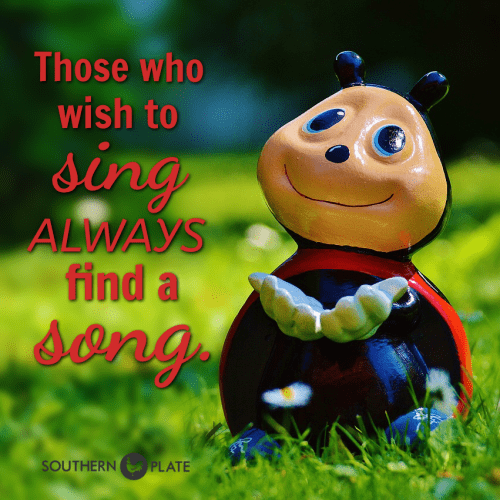 I’d love to hear what y’all have in store in the comments and I just bet you’ll inspire us all! 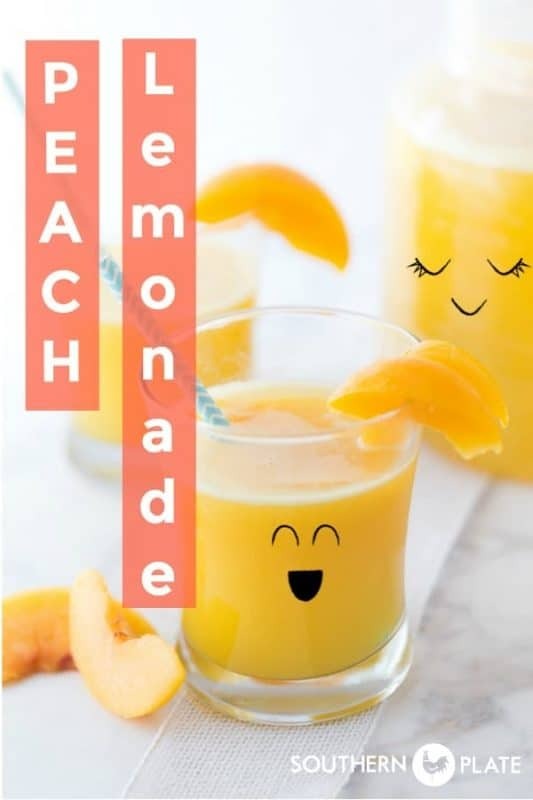 Peach Lemonade - Sugar Free & 2 Ingredients! Place peaches in blender and puree until fully liquefied. Fill two quart pitcher halfway with water. 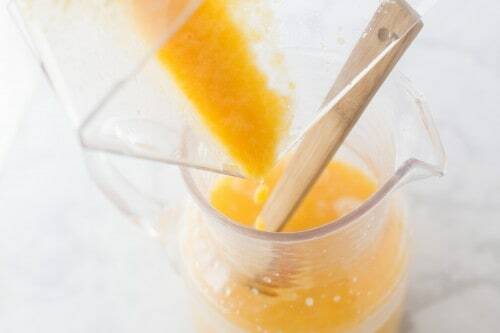 Stir in drink mix. Add peach puree and fill the rest of the way with cold water. Stir well. •You can use peaches in light syrup but make sure you drain them and know that it will add additional sugar. Thank u Christy so much for posting this! 🙂 I have 2 peach trees n a ton of peaches in august that actually a lot went bad last year because I couldn’t find enough people to eat them! BUTTT this drink sounds heavenly! cool n refreshing n first thing I’m gonna do w my peaches! 🙂 Awesome idea! U always come up w the greatest things!! oh my goodness that sounds wonderful! I also love peach freezer jam!! You are so sweet. I hope you have a wonderful summer! a she may be interested in making Peach Ice Tea. Depending on sweetness of peaches she may not have to use additional sweetener. This is one of my favorites. My Aunt Lena used to make us peach ice tea. Thank you for reminding me of it. Mary…Can’t you freeze the peaches? I have some in the freezer right now. I❤️peaches, I❤️lemonade, I must make this. Also, the cute faces on the pitcher and glass are so you, CJ! Hey Mary!!!! The whole world lights up when you stop by! Hope I get to see you again soon! Oh Christy! What a refreshing way to drink lemonade-thank you for sharing. Do you think this would work with ice tea also? We love peach tea but my concern is that the tea may be “off putting” in color-maybe murky with the peaches? Most of the peach crop here was destroyed this year by a warm winter that caused the trees to bud early then we got a cold snap. : ( I will probably be reaching for that can of peaches or maybe frozen instead of enjoying fresh ones this year. 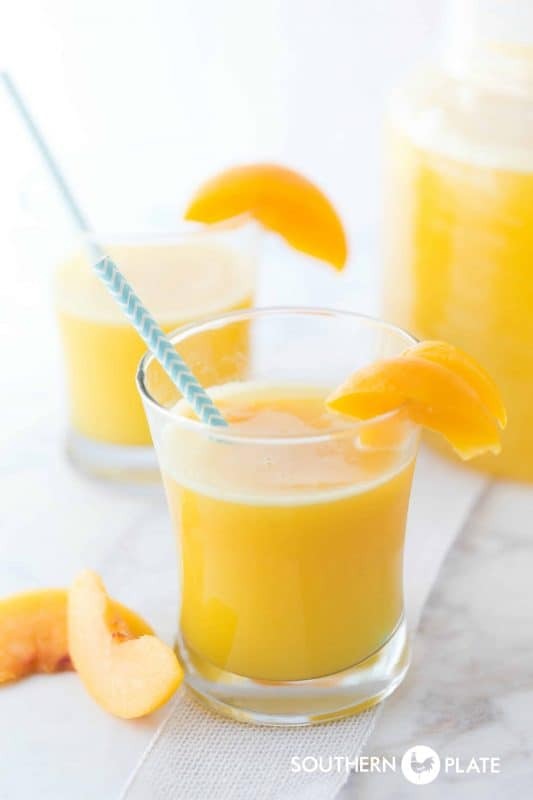 Oh-frozen peaches blended with the lemonade to make a slushy? Hope you all enjoy your vacation as well as those evenings on the porch with your lemonade! This sounds so delicious! Especially because my husband and I need to watch our sugar intake! Thank you!! I hope you get the chance to try it soon Darla!! Will try out this summer, sound great. I hope you enjoy it Mattie!! My little family loves Gatlinburg. We have been a few times. The first two trips,. we stayed in hotels. The prices weren’t terrible but we spent a lot of money on eating out. I had always wanted to stay in one of those beautiful cabins in the mountains, but could never find a decent price without huge fees. We finally found one and stayed there last year for 3 days. Well, we were just thrilled! The cabin was wonderful, big, full kitchen. Two bedrooms and two bathrooms. Our then-12 year old daughter had the whole upstairs to herself. We split that trip up and stayed part of the week with our friends in Raleigh. Hubby said next year, let’s stay a whole week. Those awful fires happened in November and we were sure for a couple of weeks that our rental cabin had been lost. I was so upset. But it turns out, that area was spared! So as soon as our income tax refund came this year, we booked that same cabin for a whole week in August. I know exactly what you mean Lisa!! We love staying in a cabin when we go to Gatlinburg too. We usually go around Thanksgiving and will rent a big one with all the extended family. We have so much fun!! I can’t wait to hear how you like it Barbara!! This sounds great; as my husband loves peach tea! Also, likes lemonade so this is a winner! Thanks! I hope y’all get a chance to try it soon Ann!! I always look forward to your emails with your newest recipes and blog. I especially like your positive attitude and advice. The other day when you mentioned how easy it is to complain and instead to be grateful really changed my day! Thank you. My family and I will be traveling to Alabama twice this summer since my daughter will be attending the University of Alabama as a freshman. Very bittersweet! Anyone else going to be an empty nester? Aww, thank you so much Lisa!!! I wish you safe travels and an easy transition into this new chapter of your lives!!! My mouth is watering, because this sounds super delicious! I’ll be making it. I’m cutting back on sugar, too. Love your blog and recipes. For my birthday in June I am going to South Carolina to visit my best friend. Thank you so much Margaret!! I hope you have a Happy Birthday and a safe trip!! This is so good! However, I didn’t realize that I was supposed to drain the peaches…I used the ones packed in juice & just dumped everything into the blender & then mixed with the Crystal Light. Very good! Next time I think I’ll try it with the peaches packed in water & Splenda, even less sugar for this diabetic lady. Can’t wait to make it for my mother-in-law & sister-in-law next month when I visit them–they’ll love this. THANK YOU! I am so glad you liked it Laura!!! Christy, I had to sign up for your newsletter again after about 3 weeks, or more, of not getting it. I remembered being on a retail site one night and there were so many ads that I clicked on Ad Choice and checked off over a dozen or so companies to stop their ads from appearing but it also stopped several emails from being sent to me that I wanted! I didn’t even recognize some of the company names but checked them anyway. Before I realized this was a result of doing that, I was imagining the worst had happened and you were either injured or sick (horses can to mind immediately!) When I went to your site I saw how many recipes & goodies I had missed, but was sooooo relieved. I hope signing up again fixes the mistake and it gets back to normal. I hope sharing my experience will keep someone else from doing it. I MISSED YOU, GIRL!!! ;( I gotta’ lot of catchin’ up & readin’ to do. I just wanted you to know that after the success I had with your strawberry lemonade, I could not wait to make this. So, on Friday for my book club I made this. Usually I make 2-2 quarts servings of a beverage and that is more than sufficient. Well, they drained the pitcher. I will be making and using this in season and out. But, I haven’t forgotten my strawberry counterpart either. I used canned peaches and the process was so easy! Keep the recipes coming! And I thank God for you! I am so glad it was a hit Dee!!! Thank you so much for trying it!! My husband is a diabetic and he loves peaches and lemonade ….so there you have it. He will really like this. I ordered a case of peaches from Georgia and the delivery person left them in my garage so I didn’t see them until they’d gotten very warm. I needed to preserve them immediately, so I made Peach Butter. It is awesome in yogurt or on toast–you dan find many great recipes online–just another idea when you have lots of peaches to keep from going to waste! Oh my goodness, how unfortunate. I am glad you found them before they were totally ruined though and you can’t go wrong with peach butter!!! Thank you SO much for this recipe. I’m always looking for sugar-free ideas and this is a perfect one for this hot summer! Will be running to the store today to get the ingredients. Hi Lori! I hope you enjoy it and y’all try to stay cool!! !